New figures reveal there were 1,733 motorists caught by officers in 2017 and 18 in the north and north-east, including those too young to drive. The statistics, released under freedom of information legislation, also show there were 3,043 instances of careless driving detected by police during the same period. In the North East division there were 1,077 people on the road without a licence, and 656 in the Highlands. 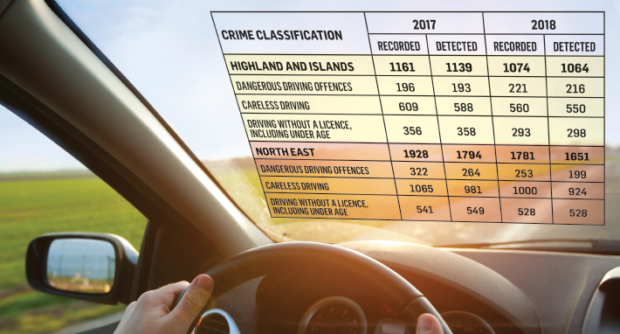 Meanwhile a similar regional breakdown reveals there were 1,905 careless driving offences in the north-east and 1,138 further north. And while the force said it was unable to provide specific figures on the numbers of underage drivers, it confirmed that the statistics did include under-17s. Figures for dangerous driving are also available and show there were 463 and 656 offences detected respectively. North East Conservative MSP Liam Kerr said:”I am particularly concerned about the number of offenders driving our roads without a licence. “This is reckless behaviour, no matter a person’s age. Earlier this week, the Press and Journal revealed there were 2,294 vehicles taken after uninsured drivers were stopped in 2017-18. During the same period, there were 4,509 insurance offences processed and recorded by the force. The highest number of seizures were in the North East division, with 1,677 taken by police. There were 2,855 offences recorded. In the Highlands and Islands, there were 617 vehicles seized and 1,624 offences recorded. Inspector Neil Morrison, from the roads policing team, said: “It goes without saying that driving without a licence is irresponsible and presents a danger to the driver and other road users.